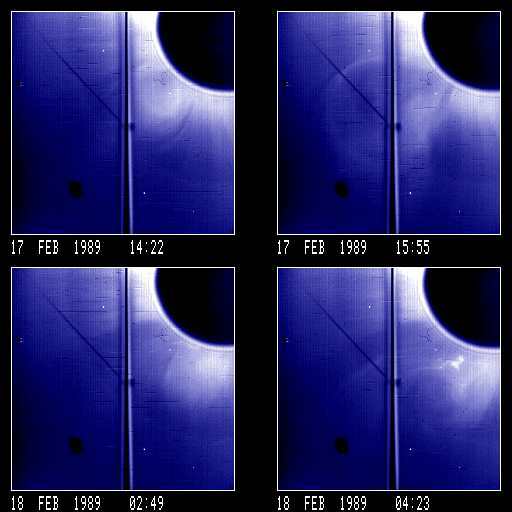 Two coronal mass ejections were recorded by the SMM Coronagraph on February 17, 1989. This sequence of four images shows the two ejections. The upper two panels contain images of the ejection that was first seen at 14:22 UT. The lower two panels are images of the second ejection that was first recorded at 21:08 UT and continued through the early hours of February 18. Both events occurred over the east limb; solar north points toward the upper left in each image. Multiple(? ), concentric loops/cavities and core superposed on streamer. `Light-bulb' shape at 15:55. Streamer is blown out. Streamers expand slowly and develop a mound-shaped front. Highly structured, bright, knotty (prominence) material follows from 02:49 to 07:38. Knotty material extends as far north at ~100 degrees at 3.0 solar radii. Streamers are blown out. Big deflections.